During wargames Iranian Air Force jets test new long-range missiles for first time in simulated combat. Part of recent military unveilings. A new missile sporting a 200 kilometer (124 mile) range was successfully tested by Iranian Air Force fighter jets on Saturday during ongoing wargames. Reports of the test, released by Islamic Revolutionary Guards's Fars News Agency, note that it is the first in simulated combat. The long-range Qader cruise missile was tested in southern Iran, during two days of massive air drills. According to military sources, the missile can be used in "future battles." 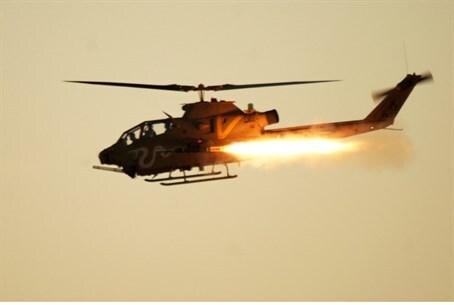 “These missiles can be mounted on different fighter jets and were successfully test-fired in these wargames,” said Brigadier General Hossein Chitforoush. The Qader, unveiled September 2011, has been mass-produced and tested, but never before in a version launched aerially. Featuring an automatic digital pilot system and anti-jamming radar systems, the missile also has rapid deployment capability. The announcement comes the same day (Saturday) that Italian Foreign Minister Emma Bonino began an official two day visit to Iran, the first visit by an Italian foreign minister in roughly a decade. Bonino is expected to meet with her Iranian counterpart Javad Zarif on Sunday. Just last Wednesday, a top Iranian official boasted that "Iran is the fifth missile power in the world." It has been noted that Iranian "indigenous" missile production would allow the Islamic regime to deliver a nuclear payload. The statement Wednesday was part of an ongoing ratcheting of military rhetoric, which has been accompanied by accusations by senior Iranian officials that the US "breached" the interim nuclear deal by expanding its sanctions blacklist. A new radar system was unveiled by Iran last Tuesday, featuring high target detection capabilities. Iranian military claimed the development will make the country's integrated radar system more powerful in electronic warfare.